I'm happy that I succeeded in doing two things: I made the drummer a high- priced guy, and I was able to draw more people to jazz." The above quote of drum master Gene Krupa was not an example of unsubstan- tiated ego. Krupa was merely aware of the facts he was the leader among drummers, the first to bring any semblance of esteem to the instrument. This is the reason drummers today revere Krupa and hope to, in some way, hold onto a small part of the Krupa legacy. Adoration and fame was something that Krupa knew throughout his career. The teeny-boppers and swing addicts couldn't get enough of the handsome drummer who could drive any band to new heights of innovation. Krupa was an original and as such, notoriety followed him like a shadow. No facet of Krupa's background or career escaped media attention, not even from the motion picture industry In 1959, Columbia Pictures released the Gene Krupa Story' starring Sal Mineo. The film was considered an artistic failure. Critics found the exaggerations, anachronisms and dramatics, characteristically stamped on film bios, a detriment. Mineo, however, was lauded for his mastery of Krupa's facial expressions, but little else in the film was found praiseworthy. It is difficult to understand why Hollywood scriptwriters found it necessary to alter the events of the drummer's much acclaimed career. 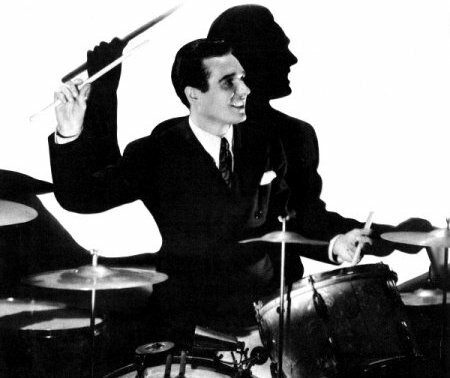 Gene Krupa was born on January 15, 1909 and raised on Chicago's South Ride He was the son of Polish-American parents. The youngest of six children. Gene Krupa and his mother originally planned that he would become a priest. Subsequentally, Krupa was educated at St. Bridges and Immaculate Conception schools. Bowen High School and St. Joseph's College. Reprinted with permission of Modern Drummer Magazine.